I've recently finished my eGPU setup and I want to share details about the process. I have to take my laptop with me daily so my choice was expresscard interface, because I can just unplug expresscard and take laptop with me. With Mini PCI-E it wouldn't be so easy. After unpacking and connecting my new EXP GDC, I had an issue with black screens. Both laptop and external screen remained black, so I had to have switch PTD to 7s to avoid race condition. My BIOS must not see the eGPU otherwise it ends with black screen. So after having PTD 7s I was able to see laptop screen working and I was able to boot successfully to win10. Windows Device Manager was able to detect my GTX680 but there was code 12 error: cannot allocate resources and external monitor remained black. So I was googling a bit and found great guide here ( https://egpu.io/forums/pc-setup/fix-dsdt-override-to-correct-error-12 ). My TOLUD is 3.5GB and I definitely didn't want to go down with my RAM so I've followed the guide to allow 36-bit addressing to host my eGPU. In the guide I've tried both intel and microsoft method in step 1. But only microsoft method works for me. Intel method ended with ACPI BIOS ERROR during booting windows. Microsoft method was the hardest part for me to resolve all compile errors. There nando4 really helped me, thank you. -Select PCI compaction->Run compact. When prompted for the scope select eGPU. Since then my setup works fine except one thing: hot restarts. When I do cold start up PTD 7s works fine but with hot restart obviously doesn't, my BIOS sees my eGPU and all screens remains black, so I have to go with shut down -> start up rather than restart. But I can live with that. The next step will be to make/buy some box where I can put my eGPU and ATX. Right now I have these unpacked on the table and it is not so practical. Hey @Batist, thank you for your implementation guide. One thing I'm curious about, is your EXP GDC 8.x stable with a Gen2 link? To confirm it's running Gen2 run GPU-Z and observe the "Bus Interface" item while putting the eGPU under load such as NVidia Control Panel->Adjust image (NVidia Logo spinning). An unreliable Gen2 link will result in "NVidia Driver has stopped responding" hiccups, requiring a switch to Gen1 (via BIOS option if available or Setup 1.35) to correct. Hi Nando, AFAIK Gen2 link is working fine in my environment, I've played Wither 3 for ca. 20h and so far so good, no crashes no freezes. I'll try to check GPU-Z and to load my eGPU by NVidia Control Panel as you suggested. I'll let you know how it goes. If it is running Gen2 successful, can you take some detailed photos of your eGPU adapter version? Would like some sample to look at for Gen2 reliability. I've otherwise been suggesting users buy a pricier PE4C-EC060A with soldered cable to get greatest Gen2 reliability. Hi @nando4, I was trying do the test you asked for and I have some difficulties. In CPU-Z I cannot see "Bus Interface" item. Pls use GPU-Z rather than CPU-Z to check the eGPU bus interface. Nice.. it's a Gen2 link. Is it stable under hours long use? Would you mind posting close up photos of it too? Would like a reference for which EXP GDC adapter version to get for reliable Gen2 operation. Sure, as I wrote I've played Wither 3 for 30 hours and I haven't seen any issues so far. There is a picture of my EXP GDC BEAST V8.4d. @batist, could you tell me where you bought your kit? I'm confused with EXP GDC Beast kits, because I can't find any stores saying it is version 8.4d, only 8.0. I want to also use an expresscard (with 1050 ti) but the thing that confuses me is the bandwidth speed which is at 4Gbps. I looked up the specs for the gtx 680 and the bandwidth speed was at 6Gbps. So are you getting 2/3 the performance? I feel like this is a naive way of thinking but I want to truly understand it. Thanks for the quick reply, alright I think I get it. So on Batist's image with his GPU-Z info, he has a bus interface capable of transferring at 2.0 x16 (500MB)*16(Lanes) = 8GBps which is also 64Gbps (max transfer rate), but he is running @ 1(lane) * 500(MBps) = .5GBps which is also 4Gbps (max transfer rate) which would be the ExpressCard's max speed. So the image I attached has the memory specs for the GTX 680 which can transfer at 6Gbps does this mean missing out on some performance or there is no difference? Hi Batist, did you finaly identify the "original" issue with the 540p? I'm trying with an GTX970, and for the moment , black screen, with or without 7s delay, new/olders geforce. If I plug express card manualy, system recognize it but not the screen / geforce drivers. I have bought"DIY eGPU setup". 4. Plug in the EC adapter or HDMI cable (test both). 5. Select Chainloader->test run, boot into Windows, install Geforce drivers. 6. Reboot system using same steps as above, check eGPU status (eg: working or error 12) and deal with appropriately. If still need further help here, then please contact me via email. I provide offline Setup 1.35 support. OK thanks nando4! I will answer via mail. I'm having the same issue with the ATMC() on my X230. Exactly which line do you need to change? I used Ctrl+F to search for it but I got 5 results. Should I change the one above the buffer values that were changed? For the exact change, batist had created a table, I don't know if it is compatible with x230. For the buffer value, compare with your asl file. Bad news!, I let the installation of the witcher3 run last night... The notebook was "asleep" this morning, I unplug expresscard , reboot and replug it just before prompt to boot with "DIY eGPU setup". I have a few BSOD with this error code : "VIDEO TDR FAILURE"
-Select PCI compaction->Run compact. When prompted for the scope select eGPU." And a little (and perhaps "strange") second one! When you active PTD on the "exp gdc beast", you don't have to let ATX PWR on ? Hello, here are the news!! I have finally reinstalled all setup from start whitout "complementary step". And just set PCIe to gen1 after a few error "VIDEO TDR FAILURE" often associated to nvlddmkm.sys or dxgkrnl errors. I have succeeded to run another benchmark with PCIe GEN2 settings, it's about 15% better, if someone know a better bench to test the PCIe load? I ask me if the T540p is particularly in cause? I had no problem with T530 with same configuration. Another remark, it seems that usage of an external usb3 dock for hdd increase the issue. I am new to the topic of an eGPU. I got an T540p and now I am wondering if the issues explained here are just specifically related to the setup with an express card to the T540p. I got a GTX 980 and need to get the best performance. I just want to take it with me when I travel, so it doesn't matter if I have to screw some parts apart. So with the best setup, what rate of performance can I expect? What's about MacOSX with this card (GTX680)? Especially mojave?! There are rumors, that this card is actually supported by mojave? Or is it only for internal GPUs? I didn't have the "TDR failure" with my T530, for the T540p it was perfectly working with PCI 1.1. When I changed the settings to 1.2 it was really strange, sometimes better with ferrite beads but not sure it was only an EM interferences issue. Anybody idea how to fix it? 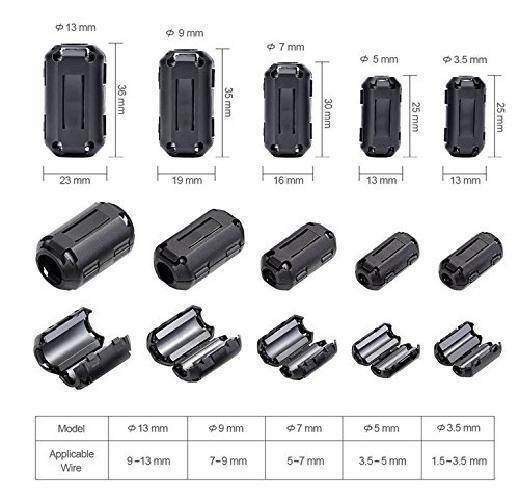 How to apply ferrite beads? What size ? Any tutorial? Hello, perhaps @nando4 could help you.